Both Aston Martin Red Bull Racing drivers tallied points Sunday, led by Max Verstappen’s fourth-place finish. His teammate Pierre Gasly climbed five positions from his grid spot to finish eighth while Toro Rosso rookie Alex Albon came home ninth for his first Formula 1 points. 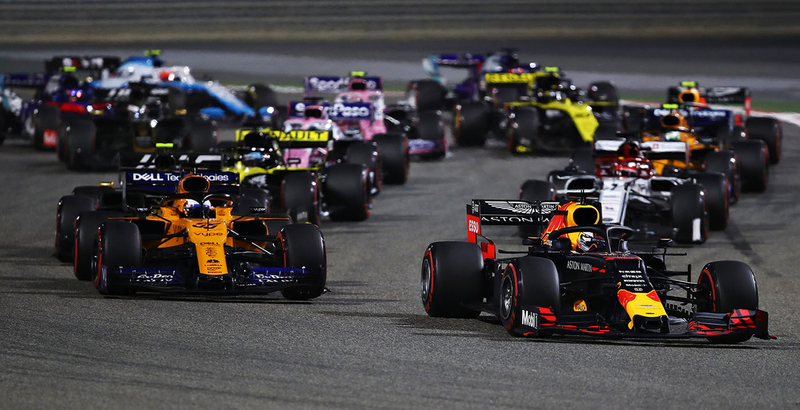 Verstappen saw a likely podium wrested from his grasp with three laps to go when the Safety Car was required to retrieve two Renaults that stopped nearly simultaneously with two laps to go. Charles Leclerc’s Ferrari suffered late-race engine trouble that dropped him from the lead to third place and was costing him more than five seconds per lap. Verstappen was less than three seconds away from taking third place from the stricken Ferrari when the Safety Car came out, effectively ending the race. Daniil Kvyat’s race was compromised when he was hit by Antonio Giovinazzi on lap 12, spinning him and dropping him down the order. Despite his best attempts to recover, he finished in 12th place just behind the Alfa Romeo having also picked up a five-second time penalty for speeding in the pit lane. “It was a tough race today, although it was positive that we managed to get all four of our cars to the flag, with three of them in the points. On the PU (Power Unit) side, it was a trouble-free weekend across both teams and that played a part in our final result in Bahrain.